We are sharing our story of our sugar babies to help raise awareness of Hyperinsulinism (HI), persistent low blood sugar. The effects of HI (seizures, brain damage and death) are 100% preventable if caught early and treated. Testing newborns with a simple and low cost blood glucose test using a pin prick of blood and a glucometer could prevent any child from ever suffering the harmful effects of HI. Currently, a newborn baby’s blood sugar is typically tested if the mother has gestational diabetes, hypothyroidism or if the baby is abnormally large or small in size. My son James did not meet any of those requirements. I did not have gestational diabetes or hypothyroidism and he weighed a perfect 7lbs. If it wasn’t for the recommendation of Neonatal Nurse Practitioner Barbie Wieder to check his sugar based on him being symptomatic shortly after he was born, things could have been very different for us. 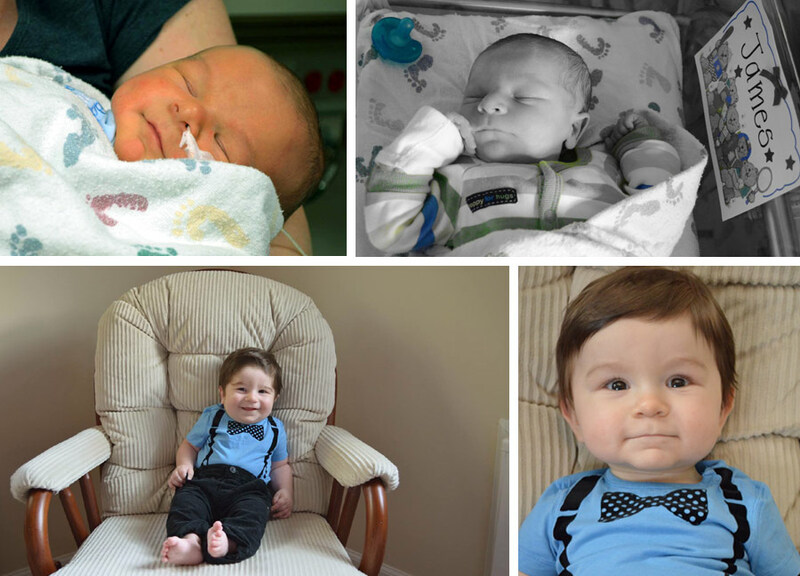 James was immediately admitted to the NICU where he stayed for two weeks. Doctors and nurses performed several tests to determine why James could not regulate his sugar. No one knew why. It wasn’t until we were transferred to the Children’s Hospital of Philadelphia, a Hyperinsulinism center, that they were able to quickly diagnose James with Transient Hyperinsulinism. We were told he would out grow it, it wasn’t genetic, and his blood sugar could be regulated through medication (diazoxide). The cause was … it just happens. And after 5 months of daily and nightly sugar checks, adjusting and readjusting medications, countless doctor visits, emails and phone calls, James’s HI was cured. We couldn’t have been happier to have it behind us and couldn’t be more grateful that he was under a doctor’s care from the moment he was born. A year and a half later I became pregnant with Matthew. I contacted CHOP and asked them if there was anything I could do to make sure this didn’t happened again. They said it was unlikely that I would give birth to another baby with hyperinsulinism because James’s HI was not genetic, but to be safe, they suggested we test Matthew’s sugar when he was born. Much to our heartache, Matthew also had HI. Shortly after birth, he was transferred to CHOP and also diagnosed with Transient Hyperinsulinism, just like his brother. It was CHOP’s first case of sibling Transient Hyperinsulinism. Matthew’s HI also resolved after 5 months of treatment, just like his brother. I am sharing our story because things could have easily been very different for us. James’s life was saved because of someone’s intuition to check his sugar and we will be forever and eternally grateful. She saved his life, and James saved Matthew’s. I am sharing our story because we could have easily and unknowingly gone home with a sick baby, who could have suffered or even died. A simple 5 second blood test for all newborns, even if they seem healthy, could prevent suffering for any baby born with HI. Let’s take luck out of the equation. Please help spread HI awareness and support newborn glucose screening.